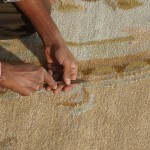 i) Pencilling- This process involves segregation of each colour strand manually with the help of a sharp thick iron needle to achieve clarity of design and colours. 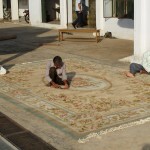 In addition at this stage any excess cotton warp or uneven wool pile is levelled. 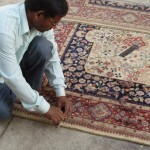 ii) Clipping and Carving – After the pencilling, carpets are sheared by hand held scissors until the pile is smooth and even. 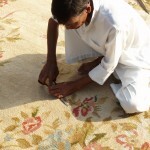 In some carpets the designs are carved to add that extra dimension to the design. 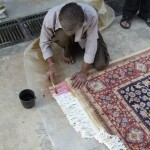 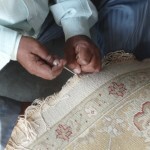 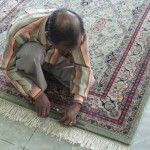 iii) Edge binding and Fringing – Edges of the carpets are bound after the clipping process. 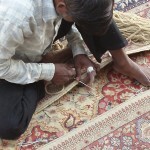 The fringes are the ends of warp which are tea dyed and knotted to secure the rug and hold it together and to give it a good finished look.